California-based ManaMed has launched the US Food and Drug Administration (FDA) approved deep vein thrombosis (DVT) prevention device – PlasmaFlow – in the US. The portable, tubeless and digital PlasmaFlow, which comes with multiple pressure functions, helps in preventing the onset of DVT in patients by revitalizing blood flow in the extremities. ManaMed says that the easy-to-operate sequential compression system can be used at home or hospital. Manamed co-founder and CEO Trevor Theriot said: “We at ManaMed are thrilled that our innovative PlasmaFlow DVT prevention device is available to help mitigate the risk to 600,000-plus new cases of DVT every year in the USA. Apart from addressing DVT, PlasmaFlow can also be used to improve blood circulation, manage post-operative pain and swelling and help in faster wound healing time. The sequential compression device can also help in treating stasis dermatitis, arterial and diabetic leg ulcers, chronic venous insufficiency, venous stasis ulcers and edema in the lower limbs. Additionally, PlasmaFlow finds it use as an aid in the prophylaxis for DVT by people who do not move around much for long durations. ManaMed says that the device incorporates step-up-technology while featuring a one-button operation and soft cuffs made of high-grade medical material. PlasmaFlow comes with a rechargeable battery that can sustain itself for up to 10 hours on one charge. It also has a couple of LCD screens to track usage and pressure. 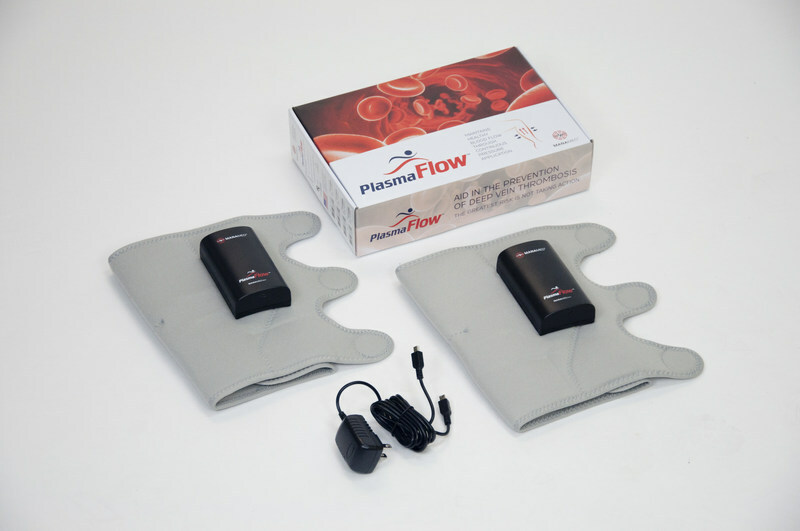 Image: PlasmaFlow Portable DVT Prevention System. Photo: courtesy of ManaMed Inc.